On this page we provide instructions and support for SAM BalanceLab. Here you can find answers to frequently asked questions or common problems. When you start the SAM BalanceLab software for the first time you have to enter the software key provided with the system. You will find it on the registration document which came with the system. If you have lost your activation code contact support@scienceandmotion.com with the serial number of your SAM BalanceLab pressure plate. After you have contacted us, we will generate the download link and activation code for you as soon as possible. The SAM BalanceLab software licenses are bound to the BalanceLab hardware (pressure plate). For each pressure plate you will need a valid software key to operate the hardware with your installed software. Up to 4 pressure plates can be registered in one software installation to make it possible to use different hardware with one computer easily. The Add-On package for launch monitor integration will allow the BalanceLab 2 / 3 software to connect to several Trackman, Flightscope and Foresight GC2 launch monitor models. The Add-On will only be available in the BalanceLab Pro software edition. If the launch monitor system is connected to BalanceLab software, launch data will be transferred for each swing and displayed in the BalanceLab recording and replay screen as a data table. If a swing is recorded by BalanceLab and launch data for this swing is transferred in parallel, the data will be stored into local database of BalanceLab. The data will then be available when the record is opened in replay. Depending on where BalanceLab 1.x data is stored, different steps will be needed to import the data. How do I send back a defective unit/item? You can help to ensure that your package arrives safely and on time. Here are some general packaging guidelines that will help you prepare your package for shipping. How can I install the SAM BalanceLab software on my computer? Just put the USB data stick into your computer, the installation program should start automatically. If it doesn’t start the “Setup.exe” file from the data stick manually. The installation program will guide you through the installation process. Note: Install the software before connecting the USB plug to your computer! 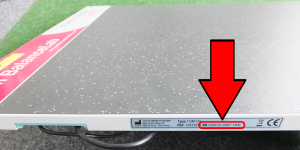 What size is the SAM BalanceLab pressure plate and what are the environment requirements for the system? How many sensors has the SAM BalanceLab pressure plate? The SAM BalanceLab is a high end technology and is using 2560 capacitive pressure sensors, which are much more accurate as compared with the cheap resistive sensors. Which extension cables work with SAM BalanceLab? In general USB cables longer than 3m/10 feet can cause problems. Most specifications guarantee proper work up to this distance. Additionally there is a dependence on the computer you use. For some models long cables work, for others they do not. SAM BalanceLab is powered by USB, so the power the USB port delivers through the cable must be sufficient to drive the BalanceLab pressure plate. At the same time communication is running and needs to be stable all the time. We have active USB extension cables available in 5m/15ft and 10m/30ft. The 15ft cable should do the job in most of the cases. Together with the original 3m cable you get a total distance of 8m/25ft. You can order the cable extensions from us directly or we can do recommendations for buying in the USA. The Price of the extensions is not critical, if we ship from Germany to countries outside the EU the international shipping cost will be the biggest part. We would estimate a total cost of $90 with UPS shipping. We only can guarantee function for cables we know as we cannot test all different extensions out there in the market. What's new in the different software versions of SAM BalanceLab? The latest software version is SAM BalanceLab 3. All features of the older versions (SAM BalanceLab 1.x and BalanceLab 2) are also available in SAM BalanceLab 3. This link list contains important documents for the software installation and the use of SAM BalanceLab. More manuals can be found in the download section. Here you will find short video tutorials about SAM BalanceLab 3 Ultimate Edition and the previous SAM BalanceLab 2 software. For more videos visit our Science & Motion Sports YouTube channel.